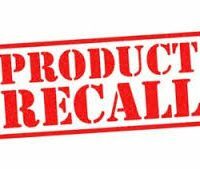 Bend’s Birdseed Food Company is recalling their “Craft Granola Goldenola Turmeric & Ginger” product that was sold in stores between the dates of October 3rd, 2018 and February 7th, 2019 because the granola contains undeclared cashews. Officials say to throw the product out, if you are allergic. The FDA said so far, no illnesses have been reported in connection with this recall.